Fuel transfer can be a risky undertaking. There’s likelihood of an explosion occurring during the transfer process or wastage created through accidental spills. A fuel transfer pump is a handy tool that saves you from such inconveniences. The pump creates enough suction to draw the fuel after which discharge is made. Fuel transfer pumps come in different types based on the power source and mode of operation. 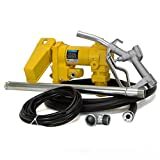 They range from siphon pumps, crank-operated pumps to electric fuel transfer pumps. The right fuel transfer pump will help you save time and add more efficiency and safety to the transfer process. To achieve this, you need to look at the features that matter in a fuel transfer pump. These include flow rate, power source, hose pipe length, suction pipe length, head, material of construction, among others. This will be followed with the types of fuel it’s designed to transfer. From this, you’ll agree with me that it’s no easy task. But don’t worry since we’ve got a list of the best fuel transfer pumps worth giving a try. This is an electric driven fuel transfer pump designed to mount on a tank or barrel. The pump is equipped with an explosion proof technology for safe dispensation of flammable liquids. It can be used to transfer kerosene, gasoline and diesel. The 12V motor powers a heavy-duty cast iron pump providing a flow rate of 15 GPM. Debris are kept at bay by a filter screen located at the inlet. The kit includes a 14 foot discharge hose and 16 foot power cord designed for longer reach. This pump sports an impressive flow rate of 20 GPM, a feature that lets you fill your tank in less time. It’s powered by a 1/4 hp DC motor rated at 13 amps. The motor has a maximum speed of 2,600 RPM and delivers enough power to provide a maximum lift of 37 feet. The pump fitted in a cast iron housing and comes with O-rings for long-term durability. A telescopic suction pipe and and 12 foot delivery hose are included for extended reach. The pump is used to transfer kerosene, gasoline, diesel and mineral spirits. This is a less powerful version of FR4210G fuel pump. It makes use of 1/4 hp 20 amp DC motor. This 12V motor drives the pump to deliver a flow rate of 15 GPM at a maximum speed of 2,600 RPM. The housing for the pump is made of cast iron to guarantee maximum durability. Hard-to-reach areas are made within easy reach by a telescopic suction pipe and 12 foot delivery hose. The pump is designed to mount on the tank and provides a safety way to transfer kerosene, mineral spirits, diesel and gasoline. 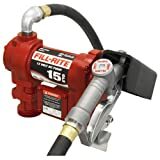 This is a cost-friendly option for those in search of a fuel transfer pump. It comes in a sturdy steel housing that’s powder-coated for maximum strength and durability. The pump has a maximum working pressure of 14.5 psi and delivers a flow rate of 10 GPM. This pump is designed to transfer diesel fuel only. A 13 foot hose and manual nozzle are included in the kit for longer reach and ease of use. This is a durable pump designed to industrial standards. It’s powered by a 12V industrial-grade DC motor rated at 1/4 hp. 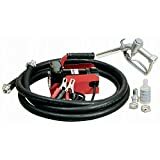 The pump dispenses 13 GPM and comes with a manual nozzle and reinforced 10 foot static wire hose for longer reach and extra safety. This pump is specially built to transfer kerosene and diesel fuels. Here’s a lightweight and compact pump that doesn’t sacrifice so much in performance. The pump weighs at just 13 pounds making it the one of the most portable on the market. It works with a 12V battery and comes with clips for the purpose. Despite it’s small size, the pump still manages to deliver an impressive flow rate of 10 GPM. A strainer is included to keep out foreign materials and other contaminants. Suction and discharge hoses measuring 8 feet each are included to provide linger reach. The hoses are made of PVC to avoid the effects of rust and corrosion. This pump is for transferring diesel fuel and anti-freeze. This electric pump makes use of 115V AC power. It’s driven by 1/4 hp thermally-protected motor. Flow rate is to a maximum of 13 GPM. A ball-bearing construction delivers quiet running and adds to the durability of the motor. The motor is designed to be explosion proof for maximum safety. Suction is through an adjustable polymer pipe while the discharge is made via a 10 foot hose. The types of fuels transferred by this pump are kerosene, gasoline and diesel. Those looking forward to transfer fuel the manual way might appreciate the performance of this fuel transfer pump. It ditches the electric motor for a hand rotary mechanism that functions to drive the pump. The rotary mechanism doesn’t require a lot of effort making it quite easy on the user. The flow rate depends on how fast the rotation is made. 100 revolutions lets you transfer up to 10 GPM. The rotation can be made in any direction. This pump comes in a rugged cast iron construction for reliable durability. It transfers diesel, gasoline, oil and other liquids of medium viscosity. This is a high quality long life fuel transfer pump. The pump sports an industrial-grade 12V motor designed to draw less amps from your power source. The housing comes in a rugged cast iron construction while the rotor is made of bronze. Such material combination creates a durable pump built to last for years. The flow rate is an impressive 15 GPM. This pump gives the convenience of an automatic nozzle to eliminate the need for manual adjustments. It comes with a 12 foot reinforced wire hose and transfers gasoline, kerosene, diesel, E15 and bio-diesel. This is a high-performance fuel transfer pump that’s got less bulk to it. The pump has a lightweight construction of 15 pounds for easy portability and handling. It provides the convenience of a self-priming mechanism so you don’t have to fill it up to create pressure. A 12V DC motor powers the pump. At a maximum motor speed of 2,600 RPM, you get a flow discharge rate of 20 GPM and a maximum lift of 36.96 feet. Suction is 8 feet maximum and you get a nozzle for added convenience.